Loose leash training is an important skill that every puppy should master. Not to be confused with heeling or more formal obedience training techniques, walking nicely on a leash means being able to walk with you on a normal walk without resisting, pulling or making erratic movements. This is the kind of walking you would expect a puppy to do when taking a stroll through your neighborhood. Many small breed dog owners often do not think about leash training when they get their new puppy. The puppy is not likely to wander very far away, they conclude and is thus easy to manage without a leash. Besides that, if the dog gets into trouble, just pick him up. Why bother with training? This type of thinking leads small breed dog owners into trouble. It is not a good excuse to omit this type or any other form of training because as we all know, puppies eventually grow into adult dogs. I would go so far as to speculate that faulty thinking about training lead to what is commonly referred to as small dog syndrome. Puppies are not born knowing how to walk on a leash. New puppy owners are often surprised when they try out a new leash for the first time. Very few puppies actually master this skill the first time around. In fact, most puppies resist at first or dart out ahead of you, pulling hard at the reigns. To help your puppy learn how to enjoy the walk, you will need some treats, a collar and a leash. Treats should be soft and tiny so the puppy can ingest them quickly without stopping to spend much time chewing. You may want to gather several different treats that you know your dog will eat. If training is to last more than a few minutes (5-10 minutes for very young dogs 3 months and younger or 15 minutes for 4 month and older puppies) have several treats ready to use. The reason we do this is because many puppies will grow tired of one type of treat and stop working unless some more enticing treat is offered. You can use either a collar or a harness, but we do not recommend any form of choker or prong collar. Having both collar and harness on hand is a good idea. Many small breed dogs do better with a harness and it is safer especially if the dog tends to pull. If you opt for a harness, you will still need a collar to hang rabies and identification tags. Lightweight leashes are best and either a 4 or 6 foot leash will work fine. Your dog will walk comfortably at your side. Your dog will stop when you stop and sit. Attach the leash to the collar and place the dog on your left side. If he sits calmly, reward him with a treat. Next, say, “Let’s go” or “come on.” Choose what every word feels right for you, but remember, you must use the same words consistently every time. 1. Your dog dashes out in front of you, pulling on the leash. 2. Your dog resists, grinding in his heals and refuses to move. 3. Your dog begins to walk comfortably on your side. Walks are a great adventure for dogs and many puppies. High spirited puppies may get so excited that they pull and move in erratic fashions making walking with them nearly impossible. If the dog pulls, stop and reverse your direction. When he calms down, begin again by repeating the words, “let’s go.” Continue in one direction as long as he is not pulling on the leash. Stop and reward with a treat and a marker word such as “Good Boy, Max” or simply “Yes.” This might take numerous attempts to get them to do what you expect. Make training classes short and positive. It’s better to work with your dog several times a day for a few minutes at a time then to set aside an hour at the end of the day. The puppy’s attention span is about the same as a human toddler or preschooler, which translates to very short. What if your dog resists after your initial gentle tugs on the leash? The best way to gain your dog’s attention is to get down low, call your dog to you and reward him when he comes with a “Yes” and a treat. Then, get up and begin the walk again. You may need to repeat this several times. If after many tries, he refuses, stop the activity and move on to something else. 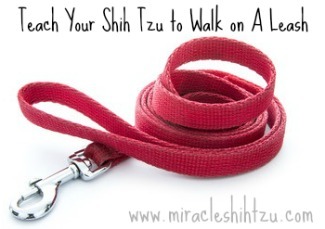 Learning to walk on a leash should be a positive experience for both you and your dog and if your dog senses you are getting annoyed or frustrated, he will shut down completely. Some things that help dogs that resist leash training include enlisting the help of another dog and allowing the puppy more time to get used to wearing the collar and leash. When not walking, you can allow the dog to keep the leash attached as he drags it around. You should be available to supervise and intervene if he gets tangled. Practice inside in an area familiar to your puppy so to eliminate some of the distractions (and interesting smells) that he might encounter outdoors. Another dog who already knows how to walk on a leash nicely can help the new puppy master the skill. Dogs are capable of learning through observation and mimicking the actions of other dogs. Congratulations! Reward with your typical verbal marker, "yes" and a treat. Encourage your dog to sit every time you stop and reward at this time. Eventually you will be phasing out some of the treat rewards and replacing with verbal praise. But you want to be sure your dog truly understands what is expected before gradually weaning him off of the treats. As your dog gets better at walking by your side and sitting when you stop, try rewarding with a treat on a random basis. This means not rewarding every time, but periodically to reinforce the behavior. If done randomly, the dog will not be able to anticipate when the food reward will happen. What about Clicker Training and Leash Training? Slow, positive consistent training will pay off in the long run with a dependable, happy, well-adjusted dog who loves to be by your side as you both enjoy a neighborhood walk.